Riding a motorcycle is both a thrilling and fun experience but it can also be dangerous if you do so without the right protective gear. Speaking about protective gear, head protection comes at the very top of the list of priorities – meaning a helmet is something you should never ever leave behind. A good helmet can protect your head from serious injuries by up to 69% and lower the risk of death by up to 42% in an accident. Therefore, if you are a motorcyclist, investing in the best helmet is not only important but life-saving, quite frankly. With the abundance of brands and models on the market, however, finding the best choice for your needs can be a daunting task. In light of this fact, we spent long hours researching and analyzing different products to bring you a list of some of the best motorcycle helmets under $100. All the helmets are easy to put on and take off, comfortable and as you’d expect; safe. If you like riding in style, then you should consider getting this helmet. It brings a ton of features to the table without requiring an equal mass of cash just to get you where you want. Boasting a glossy UV protective finish, this superior helmet is designed to operate even in sweltering conditions with no risk of sunburns. In addition to this, it is made from a lightweight shell to keep you from getting worn out especially during those long road trips. What’s more? It includes a durable exterior made of Aerodynamic Thermoplastic alloy material for extra protection. Thanks to its durable construction, it can hold up against most collisions so you don’t have to worry that it might split apart in case you crash. On top of that, the helmet comes with removable and washable padding so you can keep it clean and hygienic always. The padding also makes the helmet extremely comfortable thereby allowing you to wear it for hours on end without feeling weird. Featuring a lightweight and durable shell made of ABS thermoplastic resin materials, this helmet is, no doubt, designed to provide you with the highest level of protection. What’s more? The shell meets and surpasses DOT standards. Its interior consists of quality padding that cushions your head against impacts and offers top of the line comfort. As if that’s not enough, the helmet comes equipped with a washable and removable cheek pad. The VCAN Cruiser helmet spots a comfortable nylon chin strap along with an adjustable double D-ring closure making it easy to put on and take off. The closure system also ensures a snug fit with no wobbling at the time of riding. Available in a gloss black design, the helmet is quite stylish and goes well together with sunglasses or goggles. 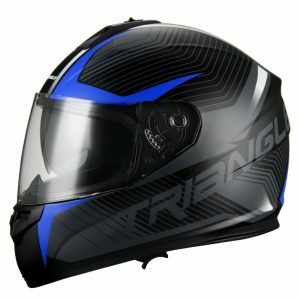 On top of that, it boasts a removable visor that is screwed in for added durability and comfortable off-road experience. This is yet another lightweight helmet that comes with solid cheek pads made of multi-density foam to ensure a superior fit. Similarly, the cheek pads are designed to be adjustable and allow for a comfortable sizing. For optimal comfort, its interior features a soft CoolMax liner that wicks away moisture from your body making it perfect for riding in hot weather. The helmet also has a padded chin strap to keep it in place while riding. Further, the GMax OF77 includes an anti-fog and inner sun shield to protect your face from harmful sun rays, wind, and rain. Best of all, the shield can easily be lowered or raised. Additionally, it boasts a big eye port so you can enjoy an enhanced range of vision both at night and during the day. 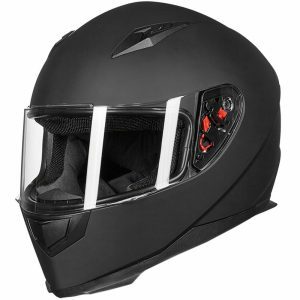 Moreover, the helmet is engineered with dual exhaust venting system at the rear, side, and top to ensure a free flow of air and reduce fogging. When you need the best comfort, this full-face helmet from ILM brand could be the ultimate choice to splurge upon. With its streamlined aerodynamic shell design, you don’t have to worry about wind noise. Moreover, it comes with an impact absorbent interior liner that is removable for ease of cleaning. 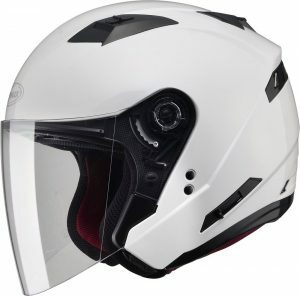 Apart from the liner, the helmet includes soft and lightweight cheek pads for increased safety and comfort. Like the rest of the products in this review, this too meets the DOT standards and thus provides total security. Another alluring thing about the helmet is that it comes with two visors including clear and smoked with anti-fog function. On top of that, its shell is crafted from top-quality and lightweight ABS materials to provide long-lasting performance and increased safety. What’s more? It is equipped with a quick-release clasp and strap that helps make for a secure and easy fit. Also included with the purchase is a neck scarf for use during winter and can easily be removed when not in use. Coming in different sizes and colors from extra small to extra-large, you will definitely have an easy time finding the right pick. The helmet is equipped with a dual forehead vent that provides optimal air circulation while minimizing the chances of sweating. As such, you can wear the helmet for many hours in warm or hot weather conditions. Apart from being DOT certified, the HJC CS-2N spots a nylon chin strap to provide you with an ergonomic fit. Moving on, the helmet is constructed with injection-molded thermoplastic alloy to provide you with the best level of protection while being extremely lightweight. Further, it includes a neck curtain with a zipper just in case you would like to remove it when it is hot outside. When it comes to comfort, this is yet another area this product does not disappoint as it features a plush Nylex interior lining. 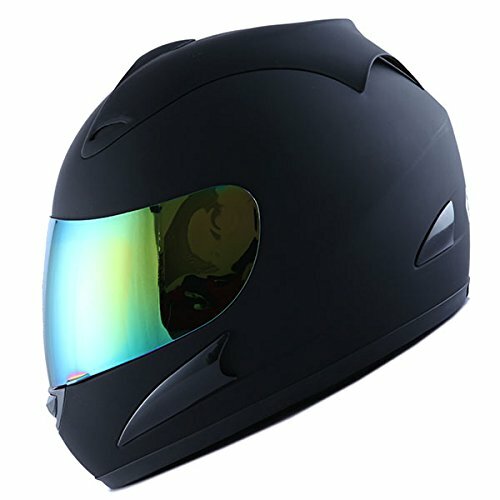 Other than this, the HJC CS-2N has an aerodynamic design and low-profile visor for improved riding experience. 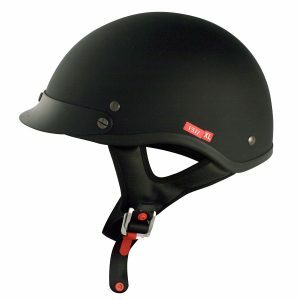 Sturdy, comfortable and lightweight, this particular helmet has everything you may need. First off, it comes with a double PC visor that is both removable and highly resistant to scratches. Also, the helmet includes a DVS treatment alongside a quick-change mechanism. And the best part is that it is equipped with an anti-bacterial liner that is fully removable and washable to ensure the highest level of hygiene. The liner is also designed to absorb any impact thanks to its multi-density EPS construction as well as keep your head cool and dry. Inside, it features laser cut padding with hygienic treatment to provide you with just the comfort you need. 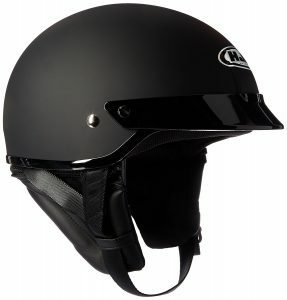 A padded chin strap along with a micrometric closure system also comes in handy to help you secure the helmet in place. Another important feature of the helmet is its ventilation system that comes with rear and top extractors for maximum airflow. Last but not least, its shell is constructed from advanced ABS materials and utilizes high-pressure thermoplastic technology to ensure long-lasting performance. While there is no such thing as the best motorcycle helmets under $100 (because individual needs are different), you cannot go wrong with any of the options mentioned in this review. All of them provide great levels of protection which is a key factor to ponder on if you want to invest in the best helmet that also looks stylish. Happy shopping!